DeviceAtlas has released its latest report exploring statistics for mobile device usage around the globe. The latest report shows a resurgence in the use of feature phones, which have eaten into smartphone share in some markets. The report also revealed the popularity of dual SIM phones with rumors of support for this in new versions of iOS. With Android Go and KaiOS offering cheaper, lower-end devices to millions, and Google's $22 million investment in KaiOS, the stage is set for a resurgence of cheaper phones. Google recently revealed that the US is the second largest market for sub $100 devices, confirming there is market appetite for cheaper, less "smart" phones, and making this a trend to watch. DeviceAtlas data showed feature phones released as far back as 2005 and 2009 were the most active in the US, with classic Nokia phones driving the lion's share of feature phone web traffic. Feature phone use continues to rise in India, where KaiOS now commands 16% OS share, and has eaten in to smartphone market share. KaiOS, an operating system for feature phones that includes a range of native apps and other smartphone-like services, continues to grow in India, while both Android and iOS lose ground. KaiOS has overtaken iOS as the second most popular mobile operating system. 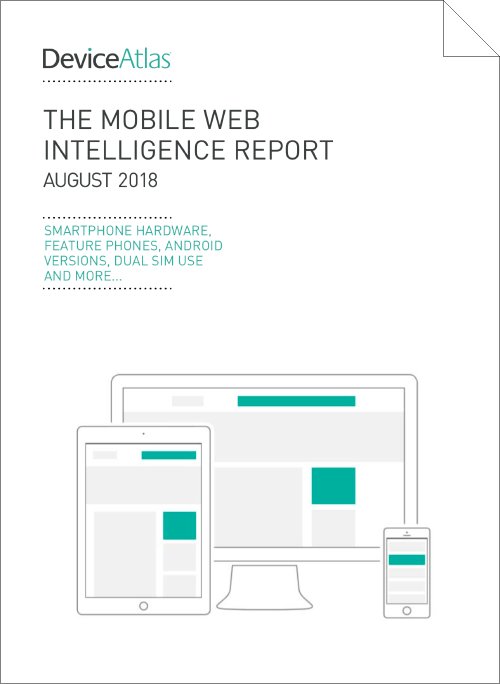 iOS lost market share of web browsing in several territories including Australia, Italy and Malaysia, while Android lost out in Canada, Japan, Spain and the UK. As it stands USA, UK, Canada and Japan have the lowest rates of dual SIM device usage. The feature is usually associated with price-conscious markets where subscribers exploit varying rates for calls, texts, and mobile data, such as India and Malaysia. Its possible inclusion in new versions of iOS may have an eye on those markets. Performance of web content has been much highlighted as essential to retain and convert customers online, as well as being an increasingly important ranking factor for SEO. As publishers become more aware of this, there is a growing need to understand how much power a visiting device possesses so that content can be appropriately tailored. The report reveals the most common specifications for smartphone GPU, CPU and RAM, as well as providing some evidence as to why it's important to be aware. Developing an app involves many decisions, and this edition of the report compiles statistics to help developers cater to the widest audience possible. Data showed that supporting Android 14 (Ice Cream Sandwich) as a minimum will enable an app to reach 99.5% of European Android users. According to Martin Clancy, Head of Marketing for DeviceAtlas, "This report underlines that web publishers and service providers ignore users on less powerful devices at their peril. The growth in feature phone traffic in India, Google's KaiOS investment, and Apple's moves to support multi-SIM devices shows they are keen to support demand for cheaper devices not just in emerging but also home markets." Methodology: Reports are based on real website visits generated only by mobile devices. The web traffic is sourced from a global network of partner websites using DeviceAtlas for content delivery and optimization purposes. About DeviceAtlas: DeviceAtlas is the industry standard for device data and the only solution that is indexed for web, apps and mobile operator environments. Launched in 2008 to meet the needs of web developers creating content for a wide range of mobile devices, it is the world's most authoritative source of device data, based on W3C recommendations. DeviceAtlas is the leading provider of device intelligence to several industry verticals ranging from major online brands, advertising platforms, financial services, gaming, analytics providers and mobile and telecoms focused companies. DeviceAtlas is a product of Afilias Technologies an expert provider of mobile and web technologies that help companies reach their customers, regardless of device, content, or context.